Let’s move on to the Fire Main Guide. What you need to know about Scarlet Blaze @ Fire Main? As you know Scarlet Blaze is one of the main characters you can choose when you start playing Naruto Online game. Scarlet Blaze is a Fire type Ninja who focuses mainly on Ninjutsu abilities. This ninja character can be used for AOE damage and Ninjutsu based Crowd Control. Moreover, Fire Main abilities can create Debuffs especially Ignition that will make Healing abilities inactive. If you’re looking for an AOE damaging character with good Crowd Control, Scarlet Blaze is a good choice to start off with. There are usually Five different types of talents for the main characters in Naruto Online game. The above mystery table shows the mysteries for Fire Main character. Like other main characters there will 4 mysteries for Scarlet Blaze. The effectiveness of these mysteries depends on the other ninjas you choose to build your team with. You just need to make sure you get your objectives right and build your team with Fire Main. There are 4 types of Standard Attacks for Fire Main. You will need to use the Taijutsu Attack until you reach level 35 where the 2nd standard attack gets unlocked. All the standard attacks are pretty much useful depending on the opponent’s team you’re against. There is no chance for the skills to miss. However, if your opponent team is immune to Debuffs , your Fire Main’s attacks will only cause damage. Let’s take an example on how your chase skill works. The first chase skill Phoenix Fire-Chase will be triggered when your team makes 10 COMBO hits. It’s pretty easy to get 10 hits when you have the right ninjas in your team. When you use ninjas like Tenten and Sasuke who also has COMBO triggered with 10 hits, you will make huge AOE damage to your opponent’s team. Passive skills of your main character will make or break your team. The passive skill you choose depends on your opponent’s team. It doesn’t really matter when you’re doing Team Instances as you will have other players in your group to help you in getting it through. When you’re going against strong opponent’s in Sage World Battlefield these passive skills are essential. Genjutsu – Mirror Return is commonly used passive skill for Scarlet Blaze Team. This is because your opponent will try to unleash their Debuff skills to the strongest ninja in your team. When this passive skill is in use, it will reflect the Debuff to the opponent’s unit. Most Fire Main team will be ninjutsu based team and the 4th passive skill will be a huge help if you need sustainability. I find these passive skills provides even more utility for your team. All the skills are pretty useful for Fire Main team. When you’re looking some sort of defense and additional damaging for your Fire team, Oboro Clone will be the best option. Moreover, Oboro Clone will help to cooldown 2 Fire Main mysteries. Other passive skills fully dependent on how you organize your lineup and the necessity of those passive skill for your team. As these passive skills often focus on your main character fully, you need to leverage on them to make your Fire Main stronger. Like the Lightning Main guide, I will provide the basic lineup for Scarlet Blaze without making holes in your pocket. This lineup will help you sustain at the top until level 60. If you manage to get super rare and rare ninjas make sure to add them to your lineup and use the right main character talents. This is the basic lineup for Fire Main or Scarlet Blaze. 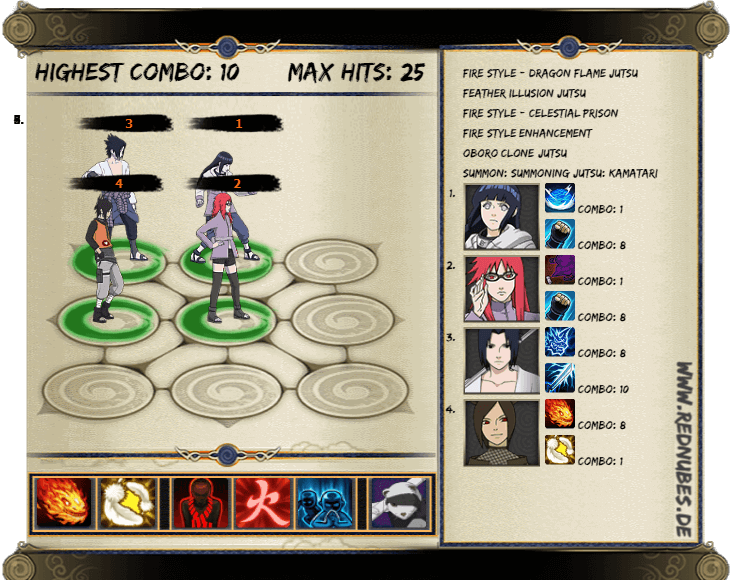 As you can see on the screenshot above, you’ll be able to make a maximum combo of 10 using Sasuke’s standard attack. And other ninjas have the potential to make 8 combos with their Standard Attacks and Fire Main can trigger the combo with the Fire Style – Dragon Flame Jutsu mystery. Karin is a great addition to the fire main team as she has a chase combo that triggers twice with Poison debuff. Moreover, she will also heal the unit with the least life point and remove 1 Debuff. You can use either Ninja Cat or Kamatari as your Summon for this lineup. Overall this is a standard team for Scarlet Blaze. This is a F2P Fire Main lineup that everyone can easily build for Naruto Online game. I will write about top Scarlet Blaze team builds in coming weeks. Although some of the lineups might require huge amount of spending on the ingots/coupons, you can still get those ninja characters by saving up your coupons and seal scrolls. What do you think about this Fire Main guide? If i missed something important, please share with us by commenting below. Thanks for the awesome guide. I think your site is the best place to find anything related to Naruto Online. Keep up the great work.